A proper post about our basement renovation is well over due. But, it's still very much a work in progress, with a lot of ceiling, trim and finishing work left to do. We are constantly working on various design features. And someday...maybe we'll be done. Here's one we completed recently. This door goes to the one storage/mechanical closet in the room. The closet takes up one entire wall of the play corner, which minimizes our storage capacity, so we decided to make the door something we can play with. 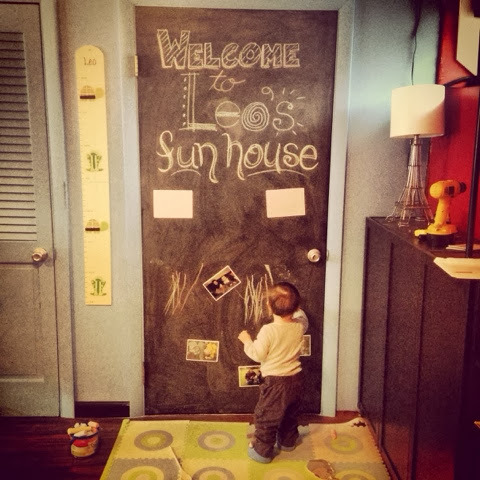 Magnetic primer and chalkboard paint to the rescue! We started with a new hollow core door because the original one had a hole cut out where we used to have a cat door. This closet used to house the kitty litter box before Leo was born, but we wanted to keep that mess well away from the play area, so the kitty door wasn't needed anymore after we made the move. It was much easier to start with a new door instead of trying to patch the hole, especially since we wanted a nice surface for chalk. The magnetic primer was definitely a challenge to use. I missed the recommendation to have the paint stirred at the store, so I spent a loooong time stirring to get the solid blob of iron filings to become something resembling paint. The instructions said three thin coats would produce the best results, but after reading some reviews online, and finding mixed success, I decided to use the entire can. After the first three coats, I concentrated more on the areas where I thought we would be more likely to use magnets. All in all, it turned out to be about seven coats. Good thing it was just a door! And since it was a new one, we were able to set it up on some saw horses in the garage, so I did the painting flat instead of vertically, which made the process much easier. After all of those coats of primer, I was relieved that one coat of chalk board paint seemed to do the trick/ Probably because I had such a nice black base coat! The chalk board paint needed to cure for three days before it was ready for writing. So, about a week after I started painting, Greg had the door hung back in place. I had to "prime"the chalk board by rubbing it completely with a piece of chalk, and then wiping it off. Apparently, this helps ensure even erasability later on. Then, we were ready to draw! 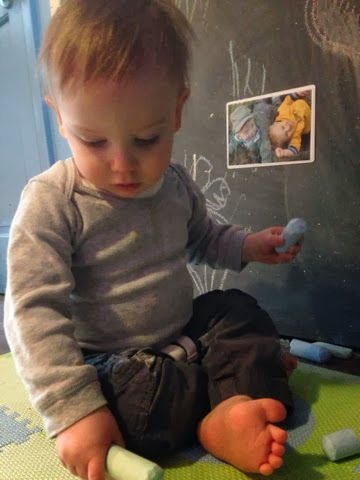 We're already putting our new chalk/magnet board to great use! Leo and I are home together on Wednesdays. I love that I get some extra time with my little man. I usually try to plan something fun for us to do, whether it's an outing, or some type of play experience that we haven't had before. I spend a lot of time perusing Pinterest to come up with simple and fun ideas. 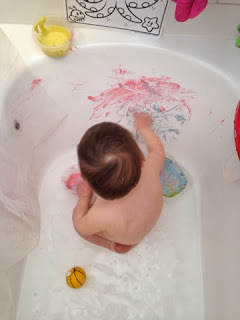 I came across the idea to make bath time finger paints the other day. 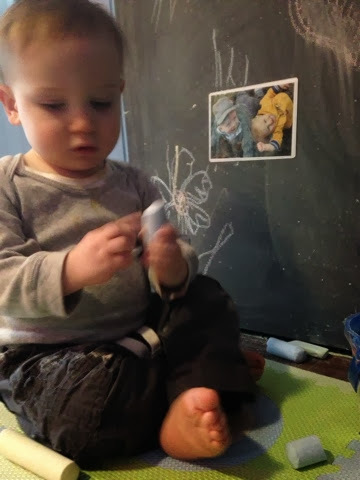 Leo does a lot of painting at school, so I thought he would enjoy this. 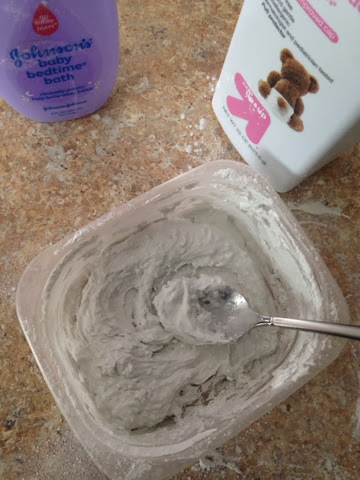 I can't seem to find the source for this recipe, and there are many other recipes for bath paint using shaving cream or corn starch. But the one I read used baby powder and baby bubble bath. I had both of these things on hand, so I figured why not. I had purchased an enormous bottle of baby powder when we were preparing for Leo's arrival when I felt like I needed supplies to be ready. 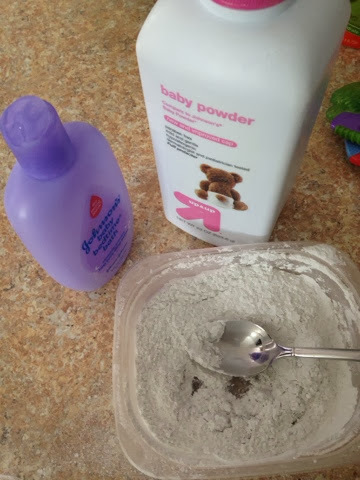 I didn't realize that using talc based baby powder has fallen out of favor, so it was great to find a use for this huge bottle (well, aside from helping to remove sand from our legs at the beach—try it, it works!) I read that you can also use water, but the bubble bath adds a bubble element, which sounded fun. I just mixed the two together until I had a consistency I was happy with. My goal with this blog is to try and share new fun things, without harping on making the process look perfectly beautiful. 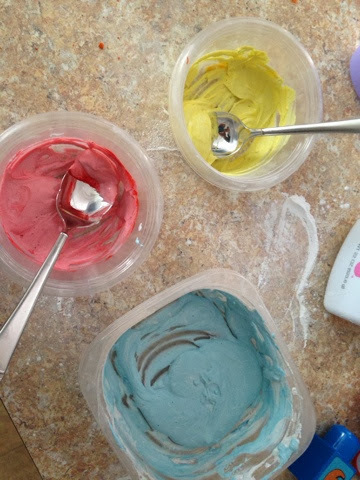 So, while a lot of other recipes show a beautiful rainbow of paint displayed in a muffin tin, I rummaged through my Tupperware drawer for three small containers, and kept it simple with the three primary colors. A few drops of food coloring was all it took. It was a big hit. Leo scooped every last drop of paint out of those containers, and then he filled them with water and dumped them out a few times. 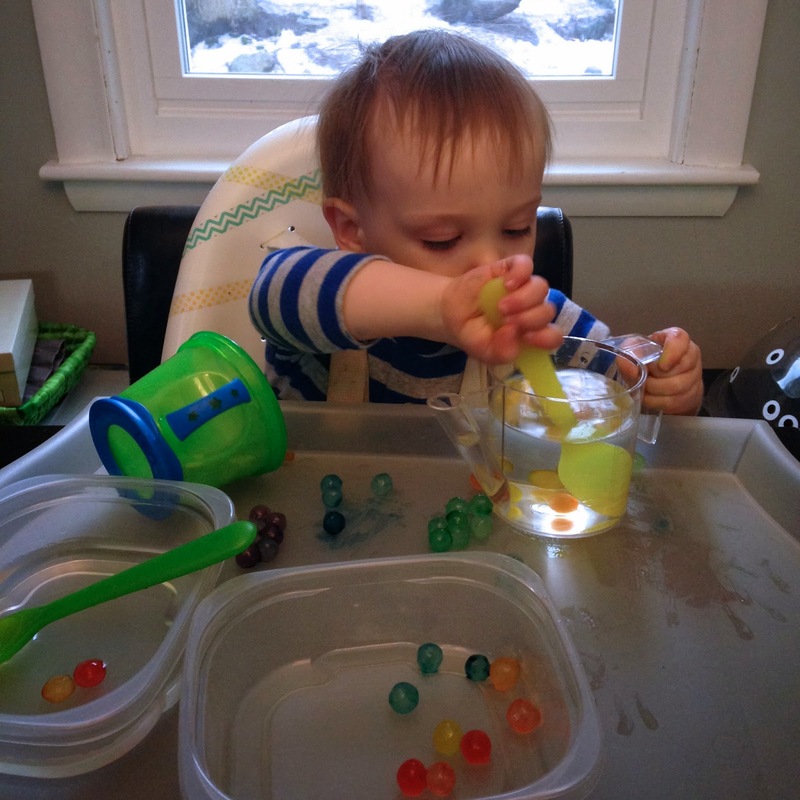 Nothing like a multi-functional toy, right? I received this same question multiple times after posting a video of Leo enjoying this experience on Facebook. I had planned a post on a different homemade play experience, but given the reaction on FB, I thought I would document this topic right away. 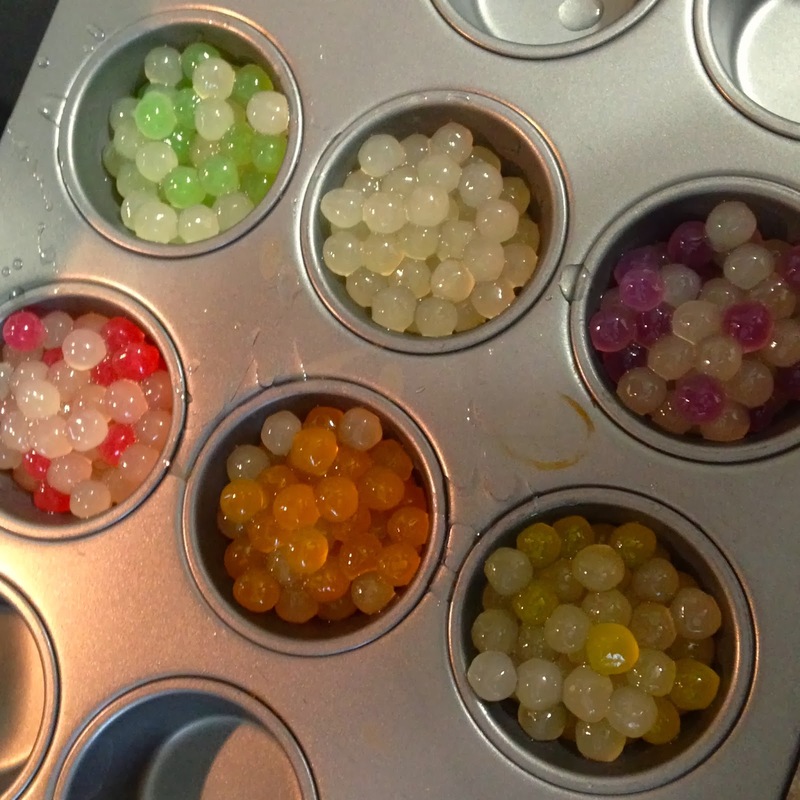 They are tapioca pearls—giant (well, relatively speaking compared to what's normally in tapioca pudding), beads of tapioca that are commonly found in a beverage called bubble tea. Yes, I have heard of that. No, I've never tried it. As is true of many of my crafty endeavors lately, I stumbled upon this idea on Pinterest. 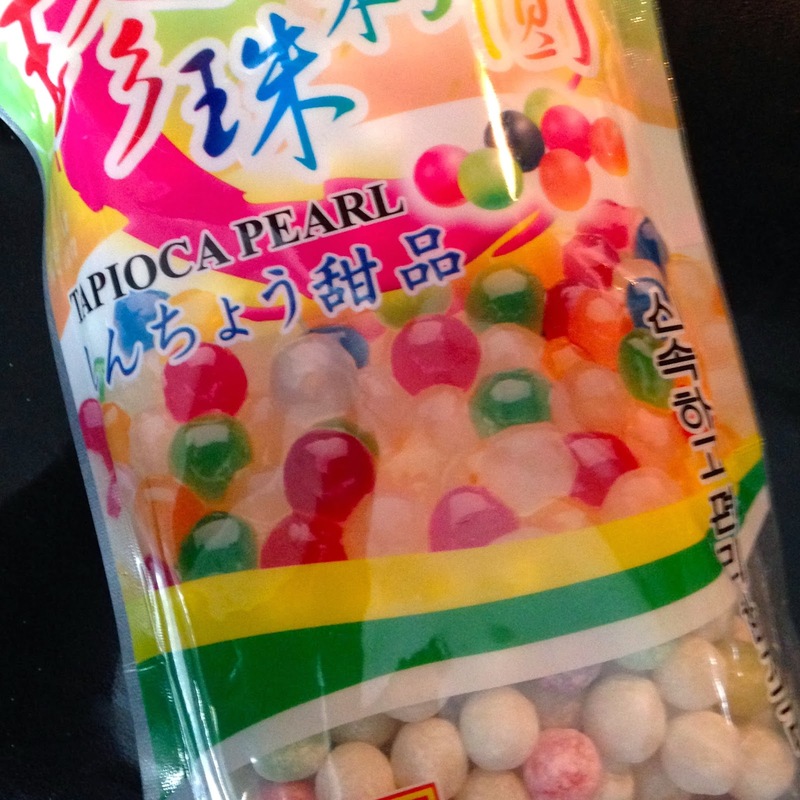 I immediately went to Amazon to purchase some Tapioca Pearls. It was important to get the quick cook type, which require boiling for only 5 minutes to be ready. I prepared them while Leo was eating his lunch. And then we let them cool while we took a nap! 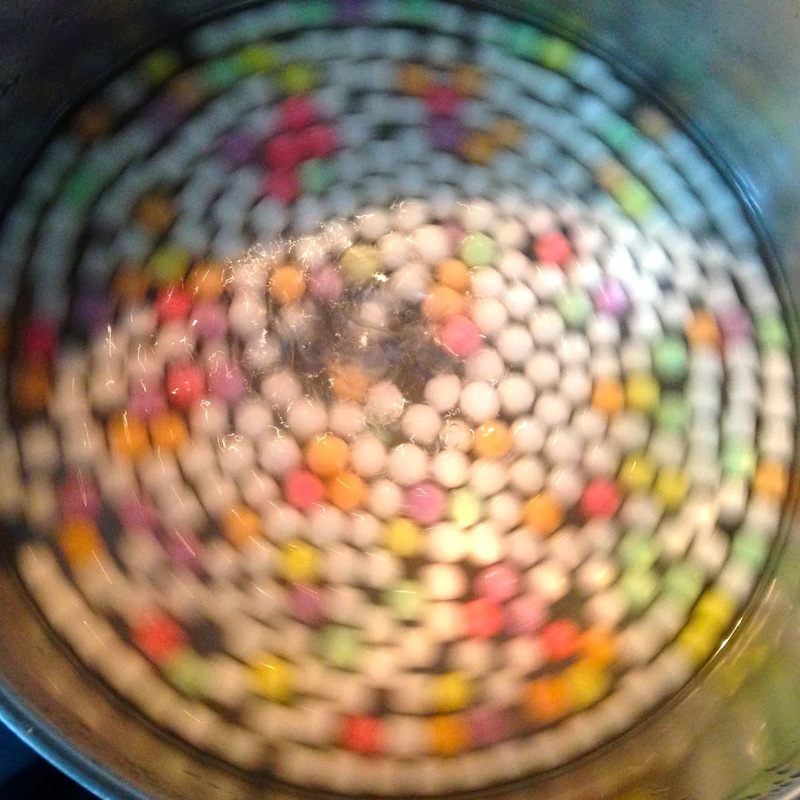 When we got up from our nap, I scooped the pearls out of the pot, and put them into a cookie sheet. As you can see, some of them come colored, and I couldn't help myself but to sort them accordingly. I then added two drops of food coloring to each pile. I didn't want to add too much color since we were planning to play with with our hands. 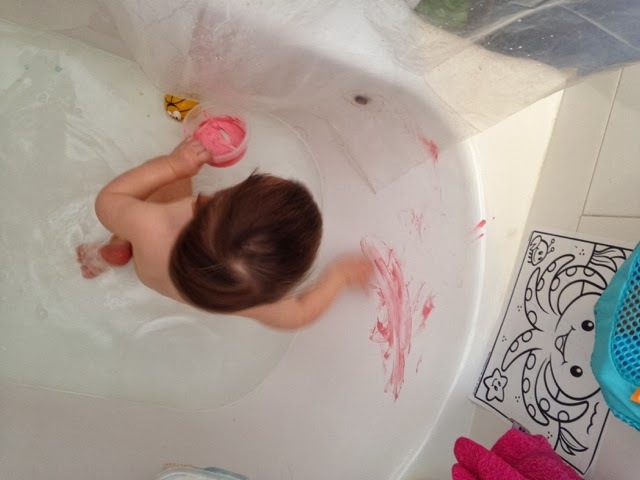 I wasn't sure how well the color would stick, and I wanted to avoid having too much get on our hands. 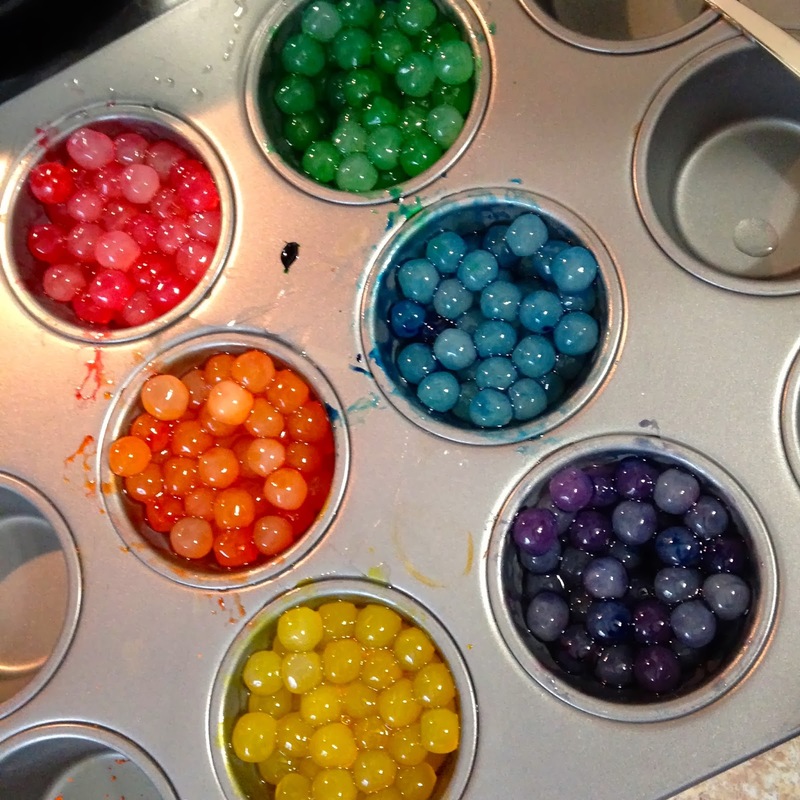 They would be just as fun to play with if you skipped the food coloring if you are concerned about the mess. 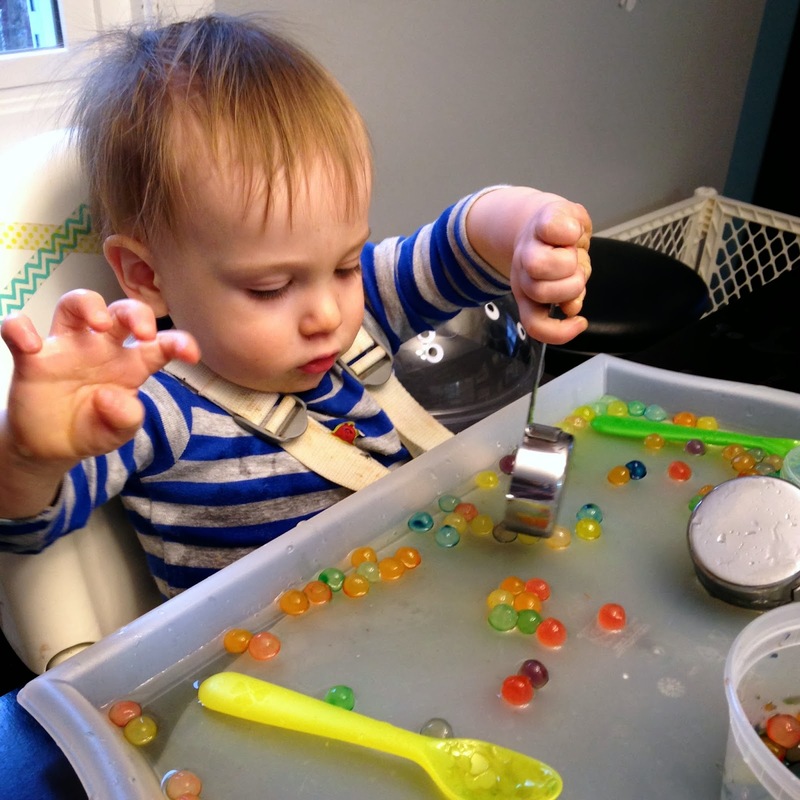 When the pearls were ready to go, I got Leo settled at the table with a tray full of containers, spoons, a bit of water, etc. and started scooping out our new toy. They are a little bit sticky, which is kind of fun in it's own right, but when they wet, the stickiness seems to go away, and they are a little easier to handle. Leo played with these for about an hour. He picked them up and put them in containers, he scooped them and dumped them. He put them one at a time into the spout of the cup, and then used a straw or whisk to shove them through when they got stuck. He did taste a few, but elected not to eat them, which I thought was a wise choice, even though they are technically edible. 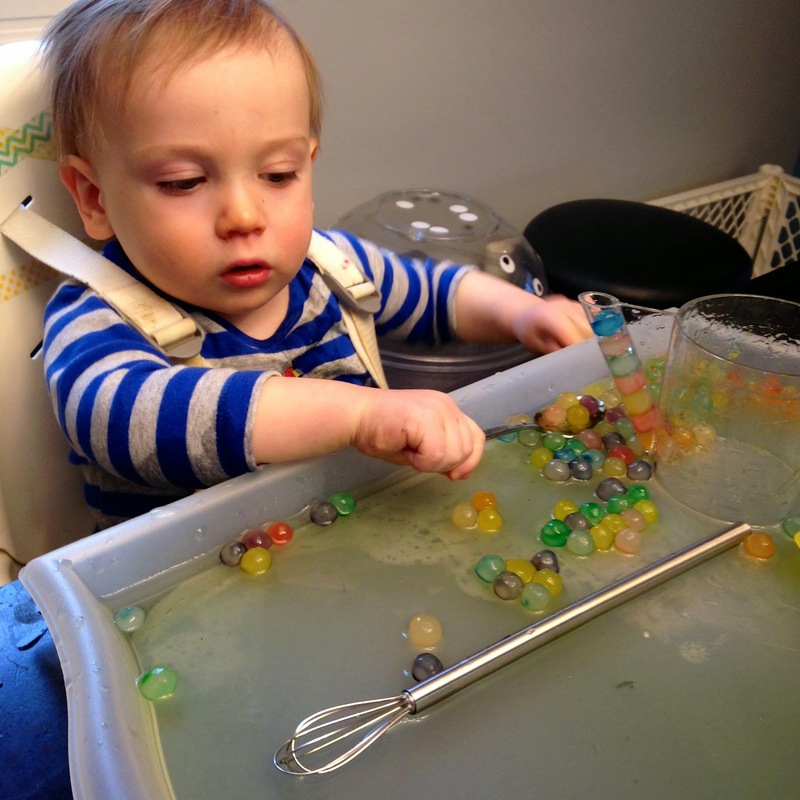 When we were done, Leo was soaking wet, but his hands were not stained a rainbow of color. 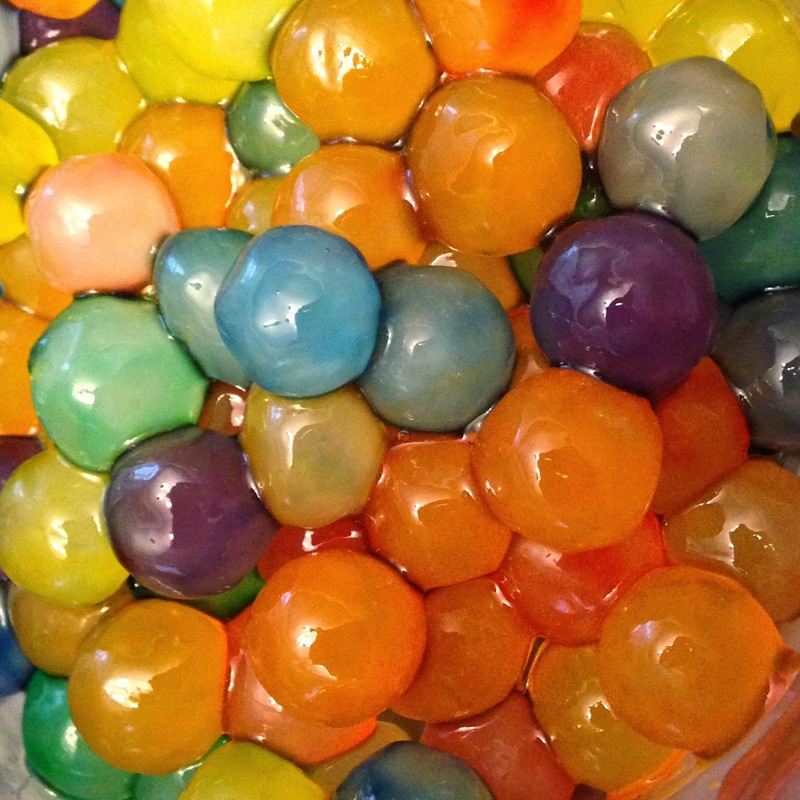 The color stayed put on the pearls, and slowly rinsed away in the water. And what's a change of clothes for an hour of fun? The best part is that we only used half of them. I saved the other half in the fridge to play with later this weekend. I'm not sure how long they will keep, they are food based after all, but I'm sure we will get at least one more session out of them. Moms are constantly asking each other for advice. Especially first time moms. I mean, none of us really know what we're doing right? There's nothing quite like the on-the-job making-it-up-as-you-go training that comes with parenthood. 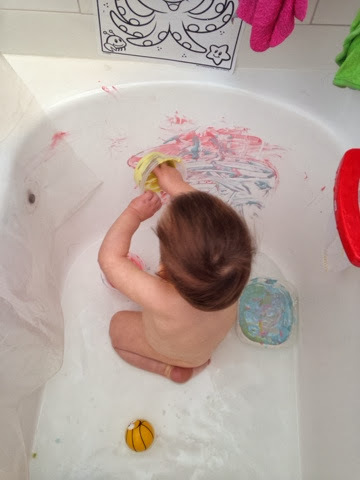 I don't consider myself an expert by any means, but I have managed to shepherd an infant safely to toddlerhood, and along the way I've been keeping a mental list of some of our favorite products. This is what I hope is the first installment of my list of Mommy Must Haves. I think somewhere along the way, most new parents these days are exposed to the five S concept from "The Happiest Baby on the Block." Shhhhhhing, or white noise is one of the key concepts. The idea is that babies are comforted by white noise as it reminds them of being in the womb. We received this white noise machine as a gift, and it's awesome. I think it helped all of us sleep better. What's great about it is when you turn it on, it stays on. It also has a timer if you don't want to leave it on. But, I'm told that when the white noise stops, babies wake up, so why would you want to do that? It also has a selection of different sounds, so you can experiment with the one you or your baby likes best. We used the ocean for awhile, but have pretty consistently stuck with the rain for quite some time. For the first six months, Leo slept in our room, so we all got the benefits of the white noise. Greg and I are a little bit addicted, as we used to turn a fan on and point it at the wall just for this purpose. Now, this lives in Leo's room, and it's used every night, and for naps. I swear, when we turn it on, he starts to yawn. I think it also helps drown out the sounds from the rest of the house. And, Greg and I still get to hear the rain fall every night through the baby monitor. If you are at all familiar with our dining room, then you know we have a high table with bar stools. This made the question of what to do for a high chair a little bit complicated. I knew that I wanted Leo to feel like a part of family meals as early as possible. 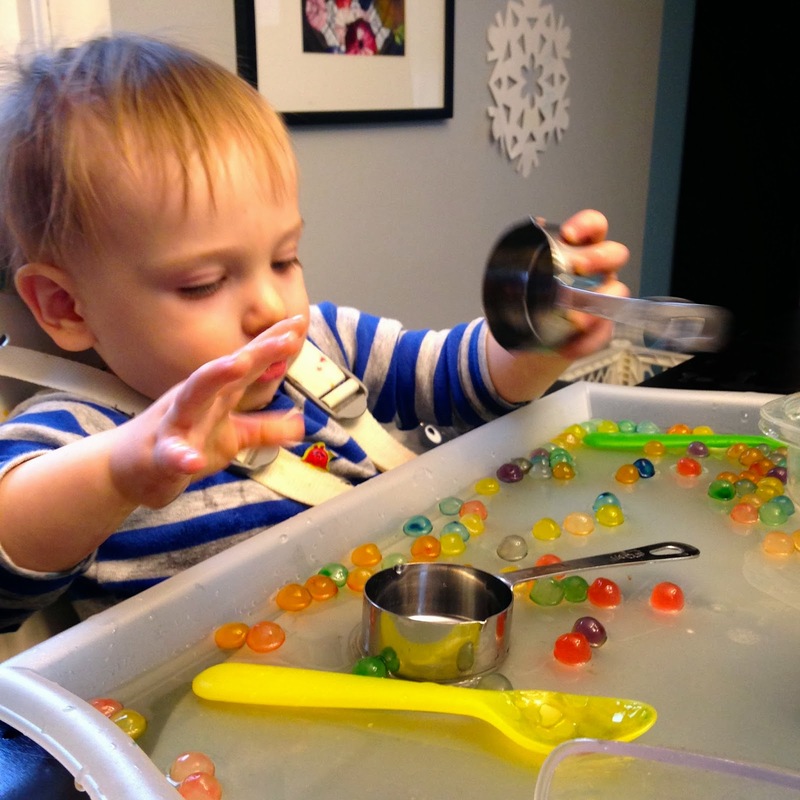 If we purchased a typical highchair, Leo would have ended up a lot lower than our table. Enter this chair, which easily straps on to any chair. So, not only do we use it on our bar stools, but we are able to take it with us when we visit friends and family who don't have a high chair. We use it with outside with our deck chairs in the summer. The next cool feature is the recline. This chair tilts to accommodate infants who can't hold themselves yet. Because of this, Leo was joining us at the dinner table at only a few weeks old. It's also great for bottle feeding once they can hold their own bottle. The straps come off easily, so we can throw them in the wash every few weeks. And since Leo has started feeding himself, we actually chose to remove the padding, even though it's washable, because it makes it much easier to wipe down the chair. We have several of these muslin blankets. They are light weight and get softer with every washing. When I was nursing, I constantly had these near by as burp cloths. 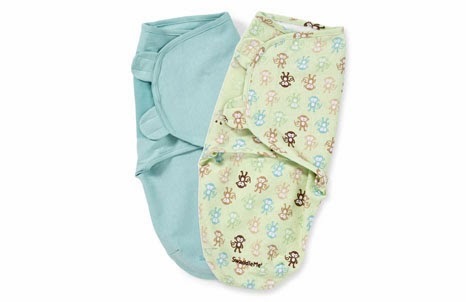 We never used them as swaddles, but many people love them for that. They were great in the summer as a light blanket, to throw down on the ground for a place to play, to drape over the stroller or car seat to help block out the sunlight. Basically, the uses are endless. We still keep one stashed in the diaper bag because you never know when your going to have a mess to wipe up. When we were in the hospital when Leo was born, they dressed the babies in t-shirts like this. They are sort of like a wrap dress, with a snap on the side inside, and then snaps on the other side on the top layer. They were great because with all the diaper changes, there was nothing to undo to get to the diaper. Also, in the very early days, before the cord falls off, these shirts don't interfere with that sensitive area. I never would have known about the shirts if we hadn't seen them at the hospital, but only days after we returned home, we had ordered half a dozen on Amazon. We used them as undershirts under Leo's sleepers for several months. We wanted him to have that extra layer, but like I said, it was nice not to have to undo a onesie for those early middle of the night diaper changes. Another one of the five Ss I mentioned before is swaddling. I think most new parents hear about the benefits of swaddling infants. It is comforting because it makes them feel like they are still wrapped up tight in the womb. Figuring out how to tie a swaddle that one come undone over night is not an easy task. There are a bunch of different swaddle products that try to make it easier. This one was one of our favorites. It's a big pouch with flaps that wrap around sort of like a straight jacket, and fasten with velcro. It was just so easy. And it doesn't hurt that it makes babies look like adorable little glow worms. Another reason we liked this particular swaddle is because it's possible to wrap up the baby's arms without putting their legs in the pocket. This makes it possible to actually strap babies in to swings, strollers, etc. while their arms are swaddled. All of those five point harnessed are useless without legs. So there you have it. A small list of items I would not want to be without were I to do it all over again. What are your Mommy Must Haves?